Learn about B2B demand generation, lead management, data hygiene, and best practices. How demand generation marketers are finding solutions to data problems in targeting, data management, segmentation, and quality. NetProspex and Pinpointe lead a FREE *interactive* webinar "Email Marketing: Tips to Increase Response Rates in 2010" Learn best practices, tips, and tricks from Craig Stouffer of Pinpointe and Gary Halliwell, CEO of NetPropex. 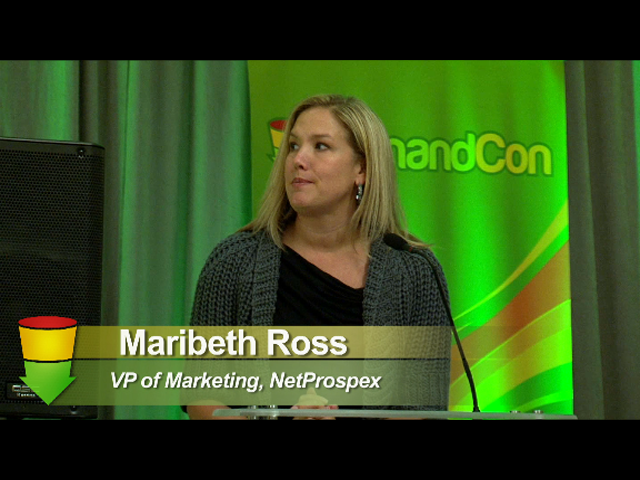 Hosted by NetProspex, providing verified business contacts for your outbound marketing efforts. Accurate email addresses are key for maintaining your sender reputation- feel secure using NetProspex's data, backed by CleneStep accuracy verification and a 100% replacement guarantee. Connect with executives and decision makers – psychologically, strategically, and financially – from the very first point of contact to prove your value. Transform your sales game to become a businessperson who creates solutions. Use a simple, analytical matrix for developing customer strategies. Develop a first-call approach to help you build stronger connections with prospects – particularly at the senior executive level. Handle prospect discovery conversations using the FOCAS Questioning Model. Marc teaches you what senior executives expect from salespeople who call on them and how to best align your approach with their buying needs. Brought to you by NetProspex - providing high-quality, verified business contact information for your perfect opportunities. Transform your sales game to become a businessperson who creates solutions. Use a simple, analytical matrix for developing customer strategies. Develop a first-call approach to help you build stronger connections with prospects – particularly at the senior executive level. Handle prospect discovery conversations using the FOCAS Questioning Model. Marc Miller, author of A Seat at the Table: How Top Salespeople Connect and Drive Decisions at the Executive Level, helps sales professionals master selling at the executive-level. Using his specialized approach, Marc teaches you what senior executives expect from salespeople who call on them and how to best align your approach with their buying needs. As the number of online conversations, through Facebook, Twitter and LinkedIn, continue to skyrocket, social media IS giving companies a very low-cost communication channel to engage prospects and customers! Join this FREE live & interactive web event to learn how social media CAN have an immediate and positive impact on your business. Start the dialogue. JOIN NOW. Be part of the conversation. JOIN NOW. Join NetProspex and Sharon Gillenwater, founder of Boardroom Insiders, as she shares best practices on targeting senior enterprise executives and increasing the effectiveness of account-based marketing efforts. Learn: - what CXOs expect from vendors who want their business - how to "move the needle" with executive-level customers and prospects - how to customize communications and programs for individual CXOs - how other companies have successfully reached and engaged CXOs Don't miss this opportunity to acquire tips and best practices that will increase the effectiveness of your sales and marketing efforts. Everyone who attends will receive a free month subscription to Boardroom Insiders. NetProspex provides high-quality, verified business contact information - find accurate email/phone/address for your targeted opportunities. Free trial account + 100 free leads for all webinar registrants. Join NetProspex and Sharon Gillenwater, founder of Boardroom Insiders, as she shares best practices on targeting senior enterprise executives and increasing the effectiveness of account-based marketing efforts. Don't miss this opportunity to acquire tips and best practices that will increase the effectiveness of your sales and marketing efforts. Everyone who attends will receive a free month subscription to Boardroom Insiders. NetProspex provides high-quality, verified business contact information - find accurate email/phone/address for your targeted opportunities. Free trial account + 100 free leads for all webinar registrants. Join us for this free webinar- reserve your spot now! Join NetProspex and Kevin Joyce, CMO of Market2Lead, a marketing automation leader known for its marketing analytics, who will provide insight and thought leadership on how marketers can better measure their impact on the sales funnel. * Did marketing influenced deals close sooner? * Did marketing influenced deals have a higher value? * Which marketing programs were most or least involved in closed won deals? * Are lead nurturing campaigns having the desired effect? Join us and learn the best ways to measure marketing's influence on sales. BONUS: All registrants will receive a free NetProspex trial account with 100 targeted prospects. You can trade your old contacts for new opportunities with our contact exchange, or download a targeted list of prospects in only a few minutes. Market2Lead offers marketing automation software and services that provide the automation and analytical insight to move more prospect relationships into customer relationships. We have a strong focus on contact data integration, data quality richness, and deeper and more accurate reporting. * Are lead nurturing campaigns having the desired effect? Join us and learn the best ways to measure marketing's influence on sales. NetProspex and Pinpointe lead a FREE *interactive* webinar - a continuation in our series of tips to improve email results. In this session, Gary Halliwell, CEO of Netprospex and Pinpointe, will trace the path of an email from send to delivery, and explain the snags along the way that *will* stop your email in its tracks. Simply put, if you don't understand how end-to-end SPAM Filtering works - you can't design for deliverability. Hosted by NetProspex - 8 million business contacts available to you via an intuitive search tool, with all data fields validated at the highest accuracy. All registrants are eligible for 100 free leads.